This article has been inspired by "reports of the death of the House of Fusion CFML forums are not greatly exaggerated". I dunno of anyone has been able to reach whoever represented the human manifestation of HoF, or just the continued radio-silence has been inferred as demise. If I was being uncharitable, I'd observe that Dom's choice of words there might sound a bit dismissive of Russ's efforts, for some reason. But I'd never be uncharitable. 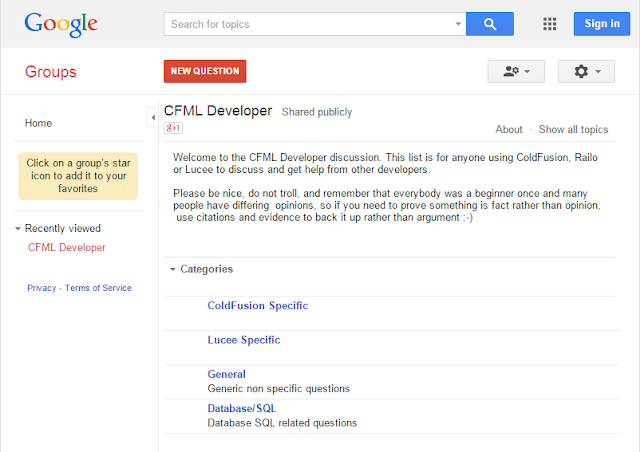 It's a good reminder that there are multiple resources for help(ing) with CFML-related stuff. And this got me thinking... exactly what "void" needed filling here? Personally I never saw the need for the HoF mailing lists: Macromedia had a perfectly functional - if not glamorous - forum suite for ColdFusion already, and Adobe have continued these (Adobe ColdFusion Forums). Railo had (OK, "has") the Railo Google Group; Lucee has the Lucee Google Group. All of these provide both a web and email interface. For a focus on getting help with CFML code, I think actually StackOverflow is the best bet, rather than the forums: ColdFusion on StackOverflow. One could ask Lucee and Railo questions there too, but they don't seem to get a great deal of attention yet, perhaps due to a lack of traction thusfar. One could try one's hand posting CFML server issues on ServerFault, but I dunno how much attention it gets. I recommend the Stack Exchange resources over the native forums because CFML does not exist in a vacuum, and Stack Exchange is the unified place to get help on anything. It makes sense to me to use it for CFML issues too. For immediately-responsive help - which can be handy - obviously there's Twitter (#cfml, #coldfusion, #lucee etc), but that's a bit of a pants way to ask for help. At best posting a link to somewhere else which can cope with more than 140 chars of info would be the way to go there. And as Dom points out there is the #CFML Slack channel. It's real time, and depending on the time of the day (daytime in the States is best), you'll likely get real-time help if you need it. But I think this fills a different niche from the likes of the existing forums, as its focus is "here and now", and that's not much use for archiving a wealth of information. Most problems I seek solutions for have already been solved, and I find them on Stack Overflow. It's beneficial if solutions to problems persist after the here and now, and I don't think Slack is good for that. My recommendation is to stick to Slack for random chatter, but use Stack Exchange for asking for help. And for conversations that are not a good fit for Stack Exchange, but could benefit from persistence beyond the here and now... sticking something on the appropriate vendor forum, and letting people know about it via Twitter or Slack might be the way to go. I will be subscribing to Russ's new forums... in addition to CFML-related traffic on Stack Exchange, the CFML Slack channel, the various CFML-related hash-tags on Twitter, and the Lucee Google Group. I do not participate in the Adobe ColdFusion forums, and I only sporadically check the Railo Google Group these days.